Prince George and Princess Charlotte will be page boy and bridesmaid at the wedding of Pippa Middleton, Kensington Palace has said. The Duchess of Cambridge's sister will marry James Matthews at St Mark's Church in Englefield, Berkshire, on Saturday 20 May. The Duke and Duchess of Cambridge and Prince Harry will also attend the wedding. Miss Middleton confirmed her engagement to Mr Matthews, a financier, last July. She was the maid of honour when the duchess married Prince William in 2011. 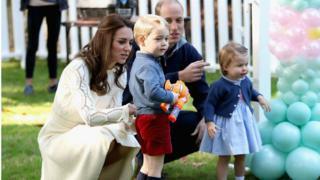 It comes as George, three, is due to start at a private London primary school in September while his sister Charlotte, who turns two in May, will start nursery in the summer.